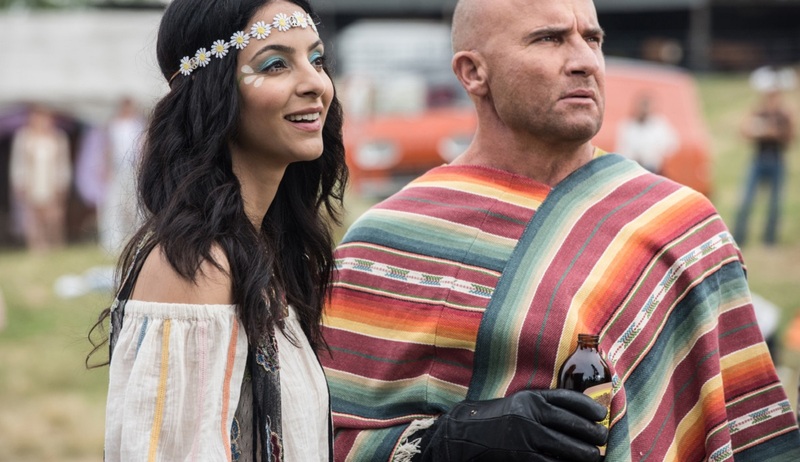 The Waverider is a pretty wild place, as was Woodstock (or so I’ve been told), so it seems like a natural fit for DC’s Legends of Tomorrow to kick off its fourth season by bringing these two wonderful things together, especially after seeing the latest photos released from the season premiere. Mick chugging a kombucha, Sara sporting some epic shades, Nate gleefully wearing a frilled leather vest, and all those headbands… It’s like the Legends were built for the Age of Aquarius! But what’s going on with Gary? The beleaguered—and usually buttoned down—Time Agent is shirtless (!!) and getting pulled from…something by Sara, Zari and Ray. I’m going to go out on a limb and says it has something to do with Matt Ryan’s John Constantine, who makes his debut as a series regular in this episode. But considering the episode’s called “The Virgin Gary,” who knows? DC’s Legends of Tomorrow returns to The CW on October 22, 2018.